tour the finally constructed, USS Zumwalt, known as the first all electric ship, but I already had travel plans for the PCGM in Santa Barbara. Darn, I thought when I retired I would have more time to do what I wanted to do! Ops, I guess I do have time; I just find a lot of things I want to do! Anyway, UCSB is a beautiful campus and it was fun to spend a couple of days there. It was fun having a few of the "science squad" there too including John, Dave, Larry, Scott and Sandra. I also just by chance bumped into Thinking About the Twin Primes Conjecture, Ken, there as we were both waiting for the shuttle from the hotel to the campus. It turns out that Ken reads this blog and I had seen his name of various emails regarding upcoming conferences, but never tied the name to the face. It was great finally meeting him. Oh, and in case you have forgotten the twin prime concept covers the observation that many known prime numbers occur as pairs, where the two numbers differ by two, for example, the pair 5 and 7, and the pair 11 and 13, all are prime numbers and the two numbers of each pair differ by two. One form of the conjecture is that there are an infinite number of such twins. Maybe Ken will prove it! Good luck, Ken! There were so many interesting papers at the PCGM, where graduate students, from colleges and universities on the pacific coast, have 10 minutes to present their topic and 2 minutes for questions, and then its on to the next speaker. This lightning round is very fast and many of the topics were way over my head, but others were interesting and understandable, and those that weren't, well, in just 10 minutes they too were over. So even when I didn't understand much of each talk, I did pick up some of the nomenclature and what topics were trending so that as I continue my study of gravity and other physics, I have some basis for seeing why and how some of these topics are necessary for future understanding of the details. Now, I wanted to summarize what I heard at the PCGM, but it will be difficult to say much about many of the over 50 topics that were just way too advanced for my just physicist wannabe mentality, but I do want to mention a quick summary of some of the things that struck me of interest. First there were many talks on AdS/CFT, which I am not going to try to explain or even mention what the letters stand for. You can look it up on you own if you dare, but it is a very hot topic of research and contender in developing theories of quantum gravity. Alexandra Miller, UCSB provided an interesting presentation on geometry, topology and quantum gravity, all over my head, but at least I got an inkling of how all of these topics come together. Another topic presented by Maximilliano Isi, Caltech, explained how new tests of general relativity using continuous wave sources, such as pulsars, like the Crab pulsar are being developed. We all of heard of gravitational wave detection from transient sources like the merging of two black holes, but the pulsars are continuous source of very faint gravitation waves that when their polarization is measured can be used to set limits on how gravity corresponds to Einstein general relativity predictions. This is science in operation where these tests are being developed to test to even higher precision, what GR equations predict. Hiroki Nagakura, Caltech, discussed some of the recent advances in supernova simulation. The physics of what happens during the brief supernova explosion are very complex and even though much of the physics is known, the equations are way too complicated to solve even with the latest supercomputers. He described some of the effort to include neutrino physics and how new approaches are leading to computable solutions. One final paper by Ian Guerrero, Humboldt State University, described some ongoing experiments. What caught my attention was not the gravitational effect being investigated, but the rigor that experimental physicists must go through to get good data. As an amateur astronomer, trying to gather photometry and spectrometry data, I know how hard it is in this little domain of known science, to get good data and not let the environment and operator error interfere too much. Anyway, Ian described how their experimental setup was showing data that seemed to have a diurnal variation buried in the data and they tracked the error down to the tilt in their laboratory table setup. Expansion of the table legs during the day caused the apparatus to tilt, ever so slightly, just in a few microradians, but enough to distort their readings. So, they had to add a temperature compensated heater to inject heat into some of the legs to compensate for the tilt caused by the environmental changes. Wow, so the laboratory is tilting and it must be stopped and controlled. So that is my brief PCGM summary, and finally, let's look at some images taken as part of the follow up study of whether the Crab Nebula is brighter than the city lights polluted view of the night sky? Remember the February 10 and 13 posts described some early attempts to measure night sky surface brightness and see if the dim M1 would be able to poke through and be visible or not. The data collected then seemed to indicate that the surface brightness was just a little bit brighter than the polluted night sky and that a longer exposure, with tracking on, might be able to get a better image. Of course, the ideal situation will be to go to a darker sky site, but we have been so frustrated by such rainy and cloudy weather that the last 3-4 planned OCA Blackstar canyon events have been cancelled. So, now that the right angle power cable for the new telescope mount has arrived in the mail, we set up outside and took some longer exposures of M1 with the tracking mount compensating for Earth's rotation. The image below was taken with the 80mm refractor with 60 second exposure. 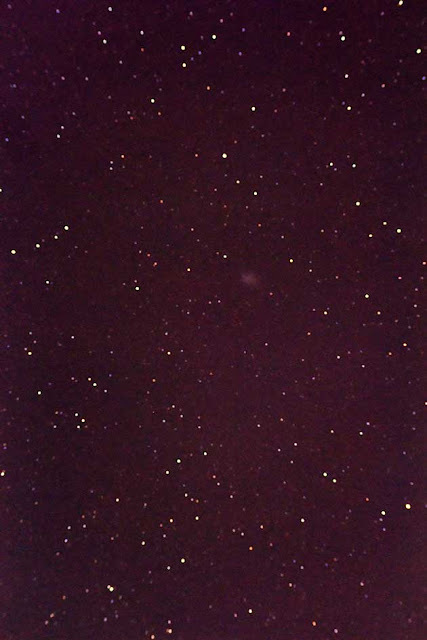 The round stars in the image show that the tracking mount is fairly well aligned and you can indeed see some little fuzzy blob of light in the center of the image. But is that fuzzy blob really M1? Well, I aligned the mount and used the goto capability and selected M1 as the target, so doesn't that mean that M1 is right there in the center? 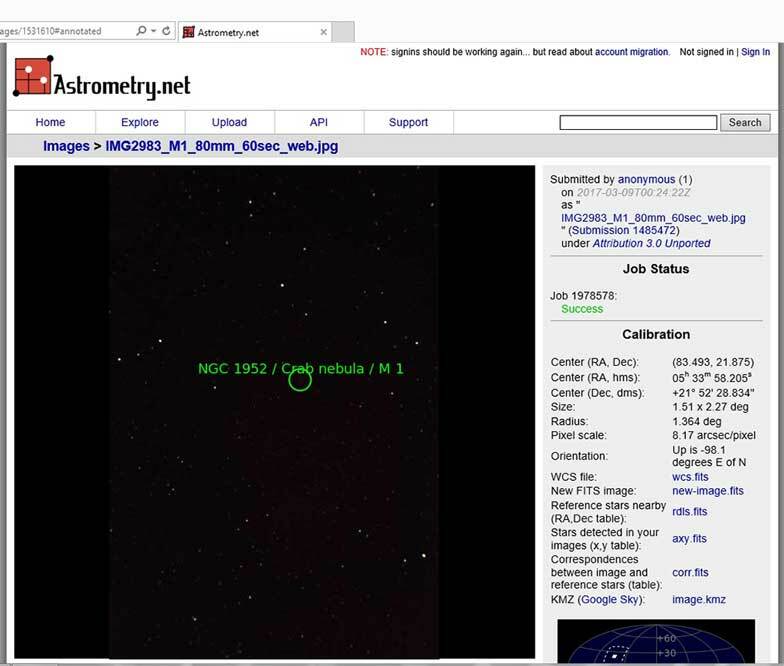 Ok, ok, all you amateurs know that unless the alignment is right on, the scope might point a little bit off course, so the above image was uploaded to Astrometry.net, and the background stars were used to find exactly where the scope was pointing. The screen shot below shows that M1 is indeed right there in the center of the image. 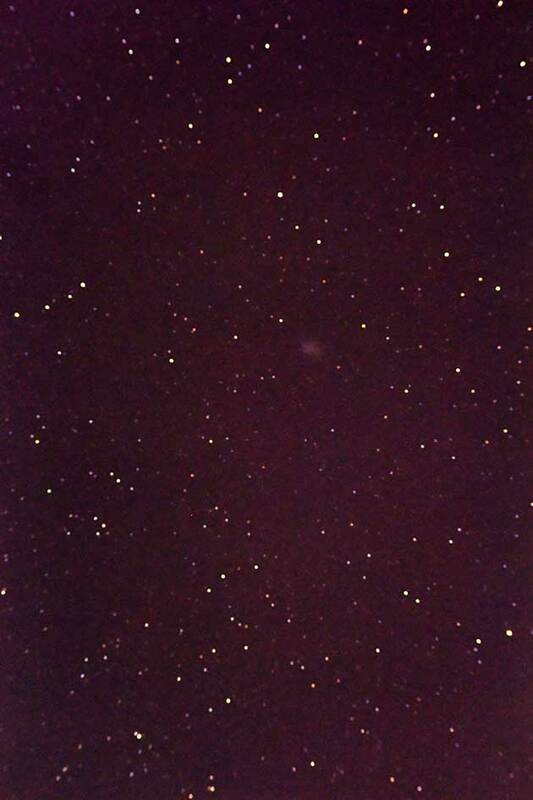 So, even though we can see a fuzzy blob, the sky is just to bright to allow capturing any of the details as seen in previous images of the Crab Nebula. 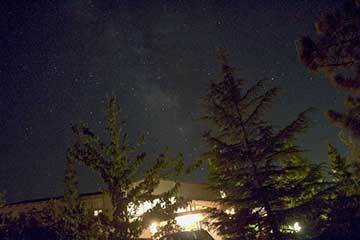 I wanted to find some more dim objects to get another data point. 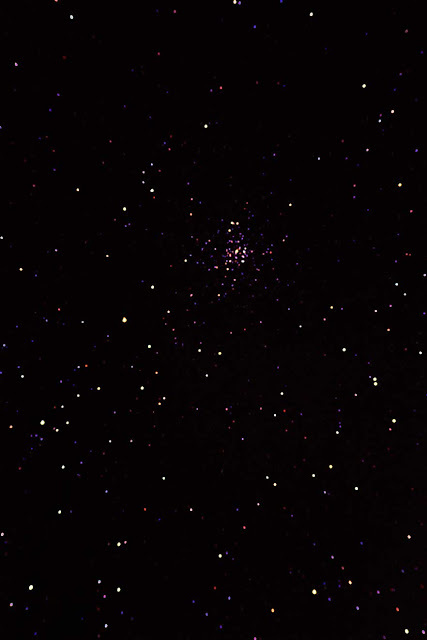 M1 has apparent magnitude = 8.4 and I couldn't find a brighter nebula in the sky at that time and so elected to view M37 Open Cluster, which has apparent magnitude a little brighter at 6.2. See the 60 second image below. So that is about it for this week. Future activities include the OCA Astrophysics SIG this Friday, travelling to San Francisco after that for the IEEE TechIgnite conference, discussing how disruptive technologies like quantum computing, artificial intelligence and smart machines like self driving cars and trucks will change or possibly change our whole economic social structure. We will see. Finally, we hope for good weather for the next OCA Black Star event on March 25.